Wonderbrand is a deeply ironic collection of retail clothing brands by Nick Graham of Joe Boxer fame. Conspired with Rich Prahm at IdleHands doing the design. 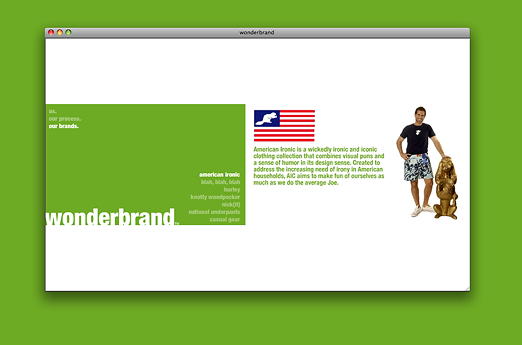 Wonderbrand.com is surreal and singularly immersive web experience. Background on all Wonderbrand Brands. Very exacting client and audience, demanding quality and irony at every turn. Distinctly ironic to the point of evangelical brutality.